Background and Objectives: In many reports, Kallikrein-related peptidases (KLKs) are emerging as cancer prognostic factors or tumor-specific markers, although their exact roles are not known very well. KLK5, a member of KLKs, has already been demonstrated for its significant prognostic value in colorectal, ovarian and breast cancers. Therefore, this study aimed to investigate the association between the expression level of KLK5 and the prognosis of patients with Hepatocellular Carcinoma (HCC). Materials and Methods: In this study, the expression of KLK5 in a total of 46 HCC patients (HCC tissues vs. adjacent non-cancerous liver tissues) was analysed using Immunohistochemistry (IHC). Then the prognosis value of KLK5 in HCC was evaluated by Kaplan-Meier survival and Cox regression analyses. 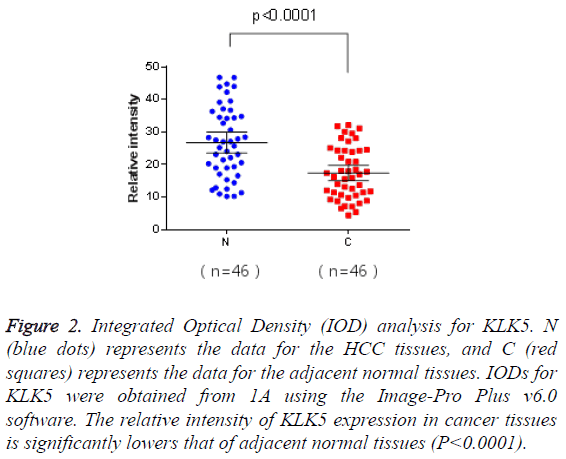 Results: KLK5 was obviously down-regulated in the HCC tissues compared to adjacent non-cancerous liver tissues (p<0.0001), and its expression level is significantly associated with tumor differentiation (p=0.038). Survival and recurrence analysis confirmed that the down-regulation of KLK5 was unfavourable for prognosis of HCC. The univariate analysis confirmed that expression level of KLK5 was able to predict OS (Overall Survival) time in HCC (HR: 0.513, 95 % CI: 0.267-0.987, P=0.046), and the multiple Cox regression analysis showed that KLK5 could be a novel independent marker for OS prediction in HCC patients (HR: 0.362, 95% CI: 0.147-0.889, P=0.027). Conclusion: The results suggest that KLK5 could serve as a novel prognostic marker in evaluating the prognosis of HCC and guiding the treatment plan. Due to its high aggressiveness, Hepatocellular Carcinoma (HCC) is the third major cause of cancer mortality around the world . HCC also accounts for almost 6% of new cancer cases diagnosed worldwide at 2011, but the mechanism involved in HCC development is still far from clarification . Until now it is clear that HCC is a multi-factorial disease caused by many factors such as cirrhosis, toxic chemical exposure and alcohol abuse . Several biomarkers have been used in the diagnosis and prognosis of HCC, including DCP (Des-γ-Carboxy Prothrombin, DCP), AFP-L3, and AFP , but their prognostic evaluation in patients with early-stage of HCC is not satisfied, especially in patients who have suffered from curative treatment . Therefore, identification of novel biomarkers with high accuracy for prognostic evaluation in HCC is clinically meaningful. KLKs are a kind of proteolytic enzymes which belongs to a sub-group of serine protease family. The KLK family has 15 members and plays important roles in normal physiological processes such as cell growth and tissue remodeling [6-9]. An increasing number of studies have demonstrated that KLKs participate in tumor progression, invasion and metastasis . For example, KLK3, also known as PSA (Prostate Specific Antigen), is widely used as a biomarker in early clinical diagnosis and monitoring of prostate cancer . KLK5, formerly known as Human Stratum Corneum Trypsin Enzyme (HSCTE), was firstly purified from the human skin tissue and shown to be activated by trypsin-like protease [12,13]. Later studies showed that KLK5 plays an important role in skin homeostasis [14,15]. Recent studies had shown that KLK5 is also involved in tumor development. For example, over-expression of KLK5 was indicative for diagnosis and prognosis in breast cancer [16,17], while Avgeris et al. found that KLK5 was significantly decreased in malignant breast tumors compared to benign tumors . Several studies have also reported that KLK5 mRNA was significantly up-regulated in ovarian cancer tissues, which was correlated with the advanced stage of the disease . Shorter overall survival and disease-free survival time of the patients had been observed with high level of KLK5 in ovarian cancer . Before this study, no work has been done to demonstrate the correlation between the alteration of KLK5 expression level and the development of HCC. Liver fibrosis is usually transformed into cirrhosis and HCC in the patients without curative treatment, which is partly due to the fact that the dynamic balance of physiological ECM (Extracellular Matrix) is corrupted and transformed into pathological deposition of ECM . As a member of the serine proteases, KLK5 could directly mediate the degradation of ECM, which then remodels liver tissue and interrupts cellcell interaction to prevent angiogenesis and promote cancer cells’ invasion and metastasis [6,22]. In addition, KLK5 could auto-active and facilitate the activation of other proteases, which makes it an initiator of several proteolytic cascades . Due to above reasons, we speculated that KLK5 might play an important role in development of liver fibrosis, cirrhosis and liver cancer. Our data in the present study indicated that the expression of KLK5 is remarkably decreased in HCC tumor tissues. Furthermore, this decrease is negatively correlated with tumor stage and prognosis of HCC. Our study suggests that KLK5 could be used as a novel promising biomarker for HCC prognosis. A total of 46 patients (24 males and 22 females) who were diagnosed with HCC histologically before 2009 at the Department of General Surgery, the First College of Clinical Medical Sciences of China Three Gorges University (Yichang, China) were randomly selected for analysis and followed until 2014 (The patients with serious surgical complications were eliminated in this study). The patient characteristics are shown in 1. The median age of the patients was 55.0 years old (age range: 36-71 years). 36 patients were succumbed due to HCC during this study. The median follow-up period was 38 months (time range: 1.2-72 months). The paraffin-embedded specimens were obtained from Yichang Central People’s Hospital for research purposes, with prior patients’ contents and approval obtained from the Ethics Committee of the First Clinical Medicine College Hospital of China Three Gorges University. Tumor stages were defined according to TNM staging system by the American Joint Committee on Cancer (AJCC 2010, 7th edition) . The diagnostic criteria for recurrence were identical to the diagnosis before the operation. The OS (Overall Survival) time was calculated as the length of time between the operation and death or the last follow-up examination. The DFS (Disease Free Survival) time was defined as the time between tumor resection and the diagnosis of tumor recurrence, death or the last observation. Tissue blocks were fixed in 10% neutral buffered formalin immediately after resection, and then embedded in paraffin and cut into slices with 4 μm thickness. 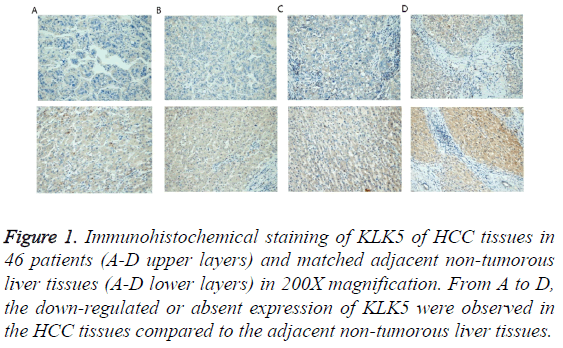 IHC staining for KLK5 was performed using the EnVison two-steps method according to the kit instruction. Rabbit anti-human KLK5 polyclonal antibody was purchased from Novus, and used in a dilution of 1:100. Integrated Optical Density (IOD) analysis was performed as following: Photographs of four representative fields were captured under high-power magnification (X200) with identical settings. IODs were measured using the Image-Pro Plus v6.0 software, and the mean IODs were calculated with four photographs per specimen. In this process, two observers were blinded to the clinical data. The intensities of staining were then categorized into four degrees: 1, negative; 2, weak; 3, moderate; 4, strong. According to the proportion of the number of positive cells, the extent of staining was divided into: 1 (0-5%), 2 (6-25%), 3 (26-50%), or 4 (>51%). The intensity of stain and the proportion of the positive cells number were then multiplied to obtain the final scores. The final results with scores less than 8 were classified as low expression and over 8 as high expression . Statistical analysis was carried out using the SPSS software package (version 18.0, SPSS, Inc., Chicago, IL). A probability of 0.05 was chosen for statistical significance. The OS rates were calculated according to the Kaplan-Meier method . The differences between groups were estimated using the test, Fisher's Exact Test, log-rank test, and the Student’s t test χ2 . For univariate and multivariate analyses, the Cox proportional hazard regression model was performed to assess the significance of different prognostic parameters in patients with HCC. The matched pairs of cancerous and adjacent non-cancerous liver tissues of the 46 HCC patients were analysed for KLK5 expression using IHC. As shown in Figure 1, KLK5 was mainly expressed in the cytoplasm of hepatocyte and then secreted into inter-cellular space. The staining densities of KLK5 in the HCC group were obviously decreased compared to the adjacent non-tumorous liver tissue group. This result suggested that the expression of KLK5 was significant downregulated in HCC tissues (p<0.05, Figure 2). Figure 1: Immunohistochemical staining of KLK5 of HCC tissues in 46 patients (A-D upper layers) and matched adjacent non-tumorous liver tissues (A-D lower layers) in 200X magnification. From A to D, the down-regulated or absent expression of KLK5 were observed in the HCC tissues compared to the adjacent non-tumorous liver tissues. Figure 2: Integrated Optical Density (IOD) analysis for KLK5. N (blue dots) represents the data for the HCC tissues, and C (red squares) represents the data for the adjacent normal tissues. IODs for KLK5 were obtained from 1A using the Image-Pro Plus v6.0 software. The relative intensity of KLK5 expression in cancer tissues is significantly lowers that of adjacent normal tissues (P<0.0001). The relationship between KLK5 expression and clinicopathological variables of HCC patients was analysed (Table 1). The result revealed that the KLK5 expression was positively associated with tumor differentiation (P=0.038). However, there were no correlation between KLK5 expression and other clinical and histological parameters used in this study. χ2 test was used for comparison between different groups. *p<0.05; HBsAg: Hepatitis B Surface Antigen; AFP: Alpha-Fetoprotein; TNM: Tumor-Node-Metastasis. Table 1: Clinicopathologic data and KLK5 expression in the tumor specimens of 46 patients with HCC. In order to examine the potential value of KLK5 expression in the prognosis of HCC patients, the Kaplan-Meier OS and DFS analyses were performed (Figure 3). At the median follow-up time, 23 among the 46 HCC patients (50%) had tumor recurrence, 36 (78%) HCC patients were dead and no one loss of contact at the end of the follow-up time. The KLK5 low expression group (n=18) showed significantly poorer prognosis compared to the KLK5 high expression group (n=28). The mean OS time and the mean DFS time for the patients with high KLK5 expression were 42 and 19 months respectively, whereas they were 27 and 14 months respectively for the low high KLK5 expression group. These results indicated that the patients with low KLK5 expression levels had shorter OS time (P<0.05). However, the DFS time was not quite different (P>0.05) between these two groups. Figure 3: Kaplan-Meier curves of the OS (Overall Survival) time (A) and the DFS (Disease Free Survival) time (B) in HCC patients. According to the expression levels of KLK5 in HCC patients, patients with high KLK5 expression level had better OS time than that with low KLK5 expression level (P<0.05, A). But the DFS time was not quite different in these two groups (P>0.05, B). We next evaluated the prognostic significance of KLK5 and other clinicopathologic parameters in HCC using the univariate and multivariate analyses (Table 2). The result of univariate survival analysis showed that, as previous studies, tumor differentiation was a significant predictor of OS (P=0.036). Meanwhile, the expression level of KLK5 was also able to predict OS in HCC (HR: 0.513, 95% CI: 0.267-0.987, P = 0.046). The patients with low expression of KLK5 had the same risk of recurrence as the patients with high KLK5 expression. Then the multiple Cox regression analysis was further used to evaluate the independent prognostic value of KLK5. The analysis (HR>1) in this assay further indicated that KLK5 low expression was a risk factor affecting the survival time. These data showed that KLK5 could be a novel independent marker for OS prediction in HCC patients (HR: 0.362, 95% CI: 0.147-0.889, P=0.027). Consistent with previous reports, our results also revealed that the serum AFP, cirrhosis and TNM were also useful independent prognostic indicators for OS (P=0.034, 0.032 and 0.035 respectively). Note: HR: Hazard Ratio; CI: Confidence Interval; AFP: Alpha-Fetoprotein; TNM: Tumor-Node- Metastasis; *p<0.05. Table 2: Univariate and multivariate analyses of different prognostic parameters in patients with HCC by Cox regression analysis. KLK5, a member of the kallikrein-related peptidase family, was demonstrated to be involved in carcinogenesis with multiple functions including degradation of Extracellular Matrix (ECM), and modulation of tumor invasion and metastasis. The recent studies have shown that the expression of KLK5 is deregulated in many neoplasms, such as colorectal cancer , ovarian cancer , breast cancer  and prostate cancer , and multiple investigators had confirmed that the expression of KLK5 could be served as a meaningful prognostic indicator to evaluate patient’s condition and guide the follow-up treatment. Although it has been reported that vitamin D, retinoic acid and some trans-activating factors such as androgens could regulate KLKs expression, the exact mechanism leading to deregulation of KLKs’ expression is still unclear . The physiological role of KLK5 in carcinogenesis is not clear yet, but the changes of KLK5 expression may cause the alteration of tumor cell behavior and characteristics, including cell differentiation, tumor aggressiveness, angiogenesis and metastasis . HCC is one of the most devastating malignancies worldwide with very poor prognosis despite therapeutic development. The recurrence rate after liver resection is approximately 50% in 2 years and 75% in 5 years . Therefore, it is of great importance to find out useful individual markers for accurate prediction of curative treatment of HCC in clinical practice, although this is still difficult. As the progression of HCC is a process with multi-steps and affected by multi-factors in the tumor micro-environment, identification of early indicator which correlated with prognosis should be able to guide us to make better treatment plans and improve the patients’ OS time. Our study aimed to investigate the possible prognostic value of KLK5 in HCC patients. According to our results, the low expression of KLK5 in HCC tissue was associated with poor tumor differentiation, indicating that KLK5 may be a reasonable biomarker of advanced tumor stage. KLK5, as a member of the serine proteases, can degrade Extracellular Matrix (ECM) including collagen I-IV, fibronectin and laminin protein, which were well-known to contribute to the pathological progression of liver cirrhosis. A recent study has demonstrated that microRNA miR-382 can facilitate the development of renal inner medullary interstitial fibrosis by targeting KLK5 in the rat kidney in vivo, and anti-miR-382 treatment could prevent this process . It is possible that the down-regulation of KLK5 might also facilitate the development of fibrosis in the process of liver cirrhosis and leads to carcinogenesis in late stage. Moreover, KLK5 has been frequently reported in the steroid hormone-regulated tissues with meaningful prognostic value [20,30,31], and liver is a main organ for sterol-hormone inactivation. Nonetheless, we do not know if there is any relationship between the expression level of KLK5 and the hormone regulation before further studies are performed. It is generally accepted that the degrees of tumor differentiation, liver cirrhosis, vascular invasion, and serum AFP level could be used for the prognosis of HCC patients [35-38]. Even the changes of KLK5 expression in serum of patients with HCC are still not reported, but the potential value of KLK5 as a tumor prognosis marker is becoming more and more obvious. The application of KLK5 as a tumor specific marker of liver would be greatly promoted, which may be used as a new prognostic indicators. Combined with other biological markers, KLK5 could improve the specificity and sensitivity of the patients’ prognosis, and provide patients with more personalized and targeted treatment, which can improve the quality of patients’ life effectively. In this study, the univariate and multivariate survival analyses indicated that low KLK5 expression was significantly correlated with shorter OS time after surgical resection in clinic. In addition, the HR data also indicated the decreased expression of KLK5 was a risk factor for overall survival time. Therefore, our study suggested that KLK5 could be considered as an independent prognostic biomarker, although further studies with a larger size of samples would be necessary to confirm the result from a limited-size research in this report. In conclusion, down-regulation of KLK5 has already been reported as an independent prognostic factor in prostate cancer . In this study, we have demonstrated that low expression level of KLK5 in HCC was related to poorer tumor differentiation and poor prognosis for overall survival of patients. The study was supported by the Institute of Hepatopancreatobilary Surgery of China Three Gorges University, Central Experiment Laboratory of Yichang Central Hospital, Hubei Key Laboratory of Tumor Microenvironment and Immunotherapy, and China Three Gorges University. The authors want to thank the members of the Department of Pathology of Yichang Central Hospital for their outstanding technical assistance, thank Professor Yanlin Wang (China Three Gorges University) for his contribution to review the article before submission. This work was financially supported by the National Natural Science Foundation of China (81602743), Hubei Province (2016CFB152), China Three Gorges University (KJ2014B070, 2015KZL04,2015KZL14). Bray F, Ren JS, Masuyer E, Ferlay J. Global estimates of cancer prevalence for 27 sites in the adult population in 2008. Int J Cancer 2013; 132: 1133-1145. Huang XB, Li J, Zheng L, Zuo GH, Han KQ. Bioinformatics analysis reveals potential candidate drugs for HCC. Pathol Oncol Res 2013; 19: 251-258. Toyoda H, Kumada T, Osaki Y, Oka H, Kudo M. Role of tumor markers in assessment of tumor progression and prediction of outcomes in patients with hepatocellular carcinoma. Hepatol Res 2007; 37: S166-171. Toyoda H. Prognostic significance of a combination of pre- and post-treatment tumor markers for hepatocellular carcinoma curatively treated with hepatectomy. J Hepatol 2012; 57: 1251-1257. Borgono CA, Diamandis EP. The emerging roles of human tissue kallikreins in cancer. Nat Rev Cancer 2004; 4: 876-890. Mavridis K, Avgeris M, Scorilas A. Targeting kallikrein-related peptidases in prostate cancer. Expert Opin Ther Targets 2014; 18: 365-383. Kontos CK, Scorilas A. Kallikrein-related peptidases (KLKs): a gene family of novel cancer biomarkers. Clin Chem Lab Med 2012; 50: 1877-1891. Borgono CA, Michael IP, Diamandis EP. Human tissue kallikreins: physiologic roles and applications in cancer. Mol Cancer Res 2004; 2: 257-280. Bayani J, Diamandis EP. The physiology and pathobiology of human kallikrein-related peptidase 6 (KLK6). Clin Chem Lab Med 2011; 50: 211-233. Rittenhouse HG, Finlay JA, Mikolajczyk SD, Partin AW. Human Kallikrein 2 (hK2) and prostate-specific antigen (PSA): two closely related, but distinct, kallikreins in the prostate. Crit Rev Clin Lab Sci 1998; 35: 275-368. Brattsand M, Egelrud T. Purification, molecular cloning, and expression of a human stratum corneum trypsin-like serine protease with possible function in desquamation. J Biol Chem 1999; 274: 30033-30040. Yousef GM, Diamandis EP. The new kallikrein-like gene, KLK-L2. Molecular characterization, mapping, tissue expression, and hormonal regulation. J Biol Chem 1999; 274: 37511-37516. Caubet C, Jonca N, Brattsand M, Guerrin M, Bernard D. Degradation of corneodesmosome proteins by two serine proteases of the kallikrein family, SCTE/KLK5/hK5 and SCCE/KLK7/hK7. J Invest Dermatol 2004; 122: 1235-1244. Descargues P. Corneodesmosomal cadherins are preferential targets of stratum corneum trypsin- and chymotrypsin-like hyperactivity in Netherton syndrome. J Invest Dermatol 2006; 126: 1622-1632. Avgeris M, Mavridis K, Scorilas A. Kallikrein-related peptidases in prostate, breast, and ovarian cancers: from pathobiology to clinical relevance. Biol Chem 2012; 393: 301-317. Papachristopoulou G, Talieri M, Scorilas A. Significant alterations in the expression pattern of kallikrein-related peptidase genes KLK4, KLK5 and KLK14 after treatment of breast cancer cells with the chemotherapeutic agents epirubicin, docetaxel and methotrexate. Tumour Biol 2013; 34: 369-378. Avgeris M. Down-regulation of kallikrein-related peptidase 5 (KLK5) expression in breast cancer patients: a biomarker for the differential diagnosis of breast lesions. Clin Proteomics 2011; 8: 5. Bandiera E. Human kallikrein 5: an interesting novel biomarker in ovarian cancer patients that elicits humoral response. Int J Gynecol Cancer 2009; 19: 1015-1021. Diamandis EP. Immunofluorometric quantification of human kallikrein 5 expression in ovarian cancer cytosols and its association with unfavorable patient prognosis. Tumour Biol 2003; 24: 299-309. Cox TR, Erler JT. Remodeling and homeostasis of the extracellular matrix: implications for fibrotic diseases and cancer. Dis Model Mech 2011; 4: 165-178. Michael IP. Biochemical and enzymatic characterization of human kallikrein 5 (hK5), a novel serine protease potentially involved in cancer progression. J Biol Chem 2005; 280: 14628-14635. Ishida-Yamamoto A, Igawa S, Kishibe M. Order and disorder in corneocyte adhesion. J Dermatol 2011; 38: 645-654. Edge SB, Compton CC. The American Joint Committee on Cancer: the 7th edition of the AJCC cancer staging manual and the future of TNM. Ann Surg Oncol 2010; 17: 1471-1474. Remmele W, Stegner HE. Recommendation for uniform definition of an Immunoreactive Score (IRS) for immunohistochemical estrogen receptor detection (ER-ICA) in breast cancer tissue. Pathologe 1987; 8: 138-140. Mantel N. Evaluation of survival data and two new rank order statistics arising in its consideration. Cancer Chemother Rep 1966; 50: 163-170. Talieri M, Li L, Zheng Y, Alexopoulou DK, Soosaipillai A. The use of kallikrein-related peptidases as adjuvant prognostic markers in colorectal cancer. Br J Cancer 2009; 100: 1659-1665. Pepin D. Kallikreins 5, 6 and 10 differentially alter pathophysiology and overall survival in an ovarian cancer xenograft model. PLoS One 2011; 6: e26075. Talieri M. Evaluation of kallikrein-related peptidase 5 expression and its significance for breast cancer patients: association with kallikrein-related peptidase 7 expression. Anticancer Res 2011; 31: 3093-3100. Lose F, Batra J, OMara T, Fahey P, Marquart L. Common variation in Kallikrein genes KLK5, KLK6, KLK12, and KLK13 and risk of prostate cancer and tumor aggressiveness. Urol Oncol 2013; 31: 635-643. Kryza T. The kallikrein-related peptidase family: Dysregulation and functions during cancer progression. Biochimie 2016; 122: 283-299. Kriegel AJ. MiR-382 targeting of kallikrein 5 contributes to renal inner medullary interstitial fibrosis. Physiol Genomics 2012; 44: 259-267. Zhou L. Prognostic factors of solitary large hepatocellular carcinoma: the importance of differentiation grade. Eur J Surg Oncol 2011; 37: 521-525. Marwoto W. Immunohistochemical study of P53, PCNA and AFP in hepatocellular carcinoma, a comparison between Indonesian and Japanese cases. Kobe J Med Sci 2000; 46: 217-229. Jonas S. Vascular invasion and histopathologic grading determine outcome after liver transplantation for hepatocellular carcinoma in cirrhosis. Hepatology 2001; 33: 1080-1086. Leung C, Yeoh SW, Patrick D, Ket S, Marion K. Characteristics of hepatocellular carcinoma in cirrhotic and non-cirrhotic non-alcoholic fatty liver disease. World J Gastroenterol 2015; 21: 1189-1196. Yousef GM, Scorilas A, Chang A, Rendl L, Diamandis M. Down-regulation of the human kallikrein gene 5 (KLK5) in prostate cancer tissues. Prostate 2002; 51: 126-132.